Third round action will take place on Thursday at the Internazionali BNL d’Italia in Rome. There wasn’t one match that really stood out but they all interest me so I thought i’d go all out and do a sweep of mini-previews for all eight third round matches… this includes Kuznetsova v Gavrilova, Suárez Navarro v Bacsinszky and Bouchard v Strycova. In case you missed it, you can read a review of all the results on day 3 of main draw action in Rome via Set Points HERE. An all-American clash lights up the Center Court schedule on Thursday. In Serena’s first match back since Miami, she looked good against Anna-Lena Friedsam, winning 6-4 6-3. The real test though will come when/if she is challenged and put under pressure by her opponent. It’s fair to say that could come against McHale who is having an excellent year. The 24-year-old has won three of her last four matches against top 20 players including a come-from-behind victory on her birthday against Ana Ivanovic in the second round, 6-7(3) 6-4 6-1. Head-to-head record: In their only previous match, Serena needed three sets in Miami to get past McHale, 6-3 5-7 6-2 in a very entertaining match. My one takeaway from that match was that McHale hit more winners than Serena in the second set! Interesting stat: This is a repeat third round match from last year in Rome where Serena pulled out with an injury allowing McHale to advance to the quarter-finals. Final thoughts: I’d go for Serena, but McHale has performed well enough this year to be deserving of respect in this match-up. 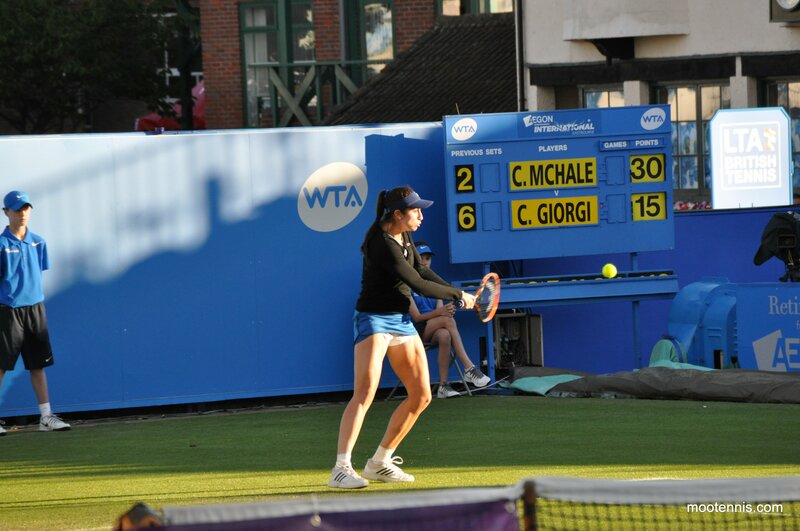 I think this may be my favourite match-up of the eight and it’s on Pietrangeli… score! I’m hoping it will time well with my lunch break. Daria Gavrilova upset the number six seed, Simona Halep, 6-3 4-6 6-3. I loved the way she played the third set, never allowing Halep to settle with bucket loads of variety and excellent defensive skills. Gavrilova seems to be back on track after a poor patch between the Australian Open and Charleston. She’s defending semi-finals in Rome but reaching the quarter-finals in Madrid last week seems to have taken some of the pressure off. Gavrilova seems to thrive in the role of being the underdog. Kuznetsova’s looking great this week and perhaps surprisingly, has been clutch! She’s beaten two tough opponents in Caroline Garcia (7-5 6-4) and Sam Stosur (6-4 6-4). I really thought she was going to go far at Roland Garros last year but she missed match points in an epic (epic is valid in this case) second round match against Francesca Schiavone. The Russian player will definitely be one to watch at RG this year. Head-to-head record: Kuznetsova won their only previous encounter in Dubai qualifying in 2013, 6-2 6-2. Interesting stat: Kuznetsova reached the final of Rome in 2007 and 2009 but rather curiously, failed to win a match at this tournament between 2010 and 2013. Final thoughts: This could be an absolute cracker if Gavrilova brings her best form. Based on her performances this week and how comfortable she is on this surface, i’d predict Kuznetsova to keep her run going. This is one of three all unseeded match-ups but it’s not a complete shock… Begu was excellent in Madrid and has always been capable, just falling short in terms of producing consistent performances week-on-week. Kasatkina has been showing promise all year and with clay her best surface, is delivering on the expectation front. Begu defeated Victoria Azarenka, 6-3 6-2, in a surprisingly straightforward second round victory, while Kasatkina backed up her first round win over the number 16 seed, Karolina Pliskova with a 6-2 6-2 triumph over Mariana Duque-Mariño. Head-to-head record: In their only previous match-up, Kasatkina defeated Begu in Moscow last year, 6-3 3-6 6-3. Interesting stat: In the space of just over a week, Begu has secured her first two top five wins of her career over Muguruza and Azarenka. Injury derailed Begu’s start to the year but her recent form has been excellent; this has included 4th round in Miami, quarter-finals in Charleston, quarter-finals in Madrid and now at least 3rd round in Rome. Final thoughts: Begu’s best level wins this match hands down but her inconsistency and shakiness at closing matches could come to the fore here. Begu’s confidence though must be sky high right now. Kasatkina has all the weapons to disrupt Begu’s rhythm including her movement on clay. I’d fancy Begu to get Kasatkina on the rails, but the Russian player to show her fighting instincts. Konta is enjoying another burst of quality form after going winless since Miami. Rome has seen her form pick up in style with convincing straight set wins over Johanna Larsson (6-1 6-2) and Roberta Vinci (6-0 6-4). Equally, Doi is having a favourable week with wins over Alizé Cornet (7-6(2) 6-1) and Lucie Safarova (6-3 7-5). Head-to-head record: Konta leads Doi, 3-0 in their head-to-head although two of those matches went the distance with Konta fighting back from a set down on both occasions. In their last match, Konta won in qualifying for Indian Wells in 2015, 6-4 6-2. Interesting stat: Doi’s record this year has been utterly baffling; prior to Rome, the Japanese player had experienced first round losses at nine of her 11 tournaments in 2016. However, the two tournaments where she has won matches, she’s gone all the way to the final including being crowned champion in the $125k San Antonio tournament. Final thoughts: There’s a lot to like about Doi’s game and her attacking nature helped her to the win over Safarova. However, Konta’s looking just as good and I think she will be the more solid player mentally too if this gets tight. Thumbs up to this match-up… Suárez Navarro beat Teliana Pereira in her first match of the week in Rome. She let a 6-1 5-1 lead slip, twice failing to serve out the match, but regrouped and played a convincing final service game to secure her place in the third round. Bacsinszky has been one of the most consistent players on tour during this clay court season and with a pretty favourable draw, has yet to be pushed past 6-4 in any of the four sets she has played. Head-to-head record: Suárez Navarro leads Bacsinszky, 4-2 in their head-to-head. CSN won their last match handily in Doha, 6-2 6-2 although Bacsinszky was mummified with bandages on both legs. The pair are 1-1 in clay court meetings with CSN winning a three setter at the French Open back in 2014, 7-5 1-6 6-4. Interesting stat: Bacsinszky started the year with just one win in her first six matches but since, has put together an impressive 17-6 W-L record. Final thoughts: I don’t think too much can be read into their last match in Doha where Bacsinszky was coming back to form, but didn’t look physically ready. With Timea’s confidence obviously high, this should be a very competitive match. This will be a solid test of Suárez Navarro’s fitness after she appeared to be ill in Madrid. A day off should help the Spaniard who i’m leaning towards… barely! This could be tasty. I thought Muguruza would face a tough challenge against Ekaterina Makarova in the second round… wrong! Muguruza was a perfect 14 out of 14 on first serve points and dropped just 19 points in a 6-1 6-0 rout. Makarova’s a really solid player so a scoreline like this is very surprising. Muguruza has had a few of these results and it will be interesting to see how she backs it up. Next up is Ostapenko, who has dropped just six games through her first two matches with very comfortable wins over Kristina Mladenovic and Monica Puig. Interesting stat: Ostapenko has lost her first match at seven out of 12 tournaments this year; however, dotted through the year have been some excellent results including a first Premier final in Doha. Final thoughts: Interesting one… i’m not brave enough to go for Ostapenko but with recent wins on her side, she could be a right handful for Muguruza. In the two late night matches, Keys and Babos both upset seeds to book their places in the third round of Rome. Keys produced a surprisingly (!) clean display to see off Petra Kvitova in straight sets, 6-3 6-4. The American finished the match with three consecutive aces and kept her winners-unforced error ratio solid. Babos was embroiled in an absolute slugfest with Venus Williams, coming from a set down and then 1-3 down in the third set to win, 6-7(5) 7-5 6-4 in two hours and 55 minutes. It was a gripping match and both fought tremendously well. Babos wavered at times and wasted leads, but showed plenty of heart to secure the win. Head-to-head record: Keys and Babos are tied at 1-1 in their head-to-head; Keys won their first match in Cincinnati in 2012, 6-3 6-0, but Babos prevailed in their most recent encounter, 6-2 6-1 in Birmingham in 2014. Interesting stat: Babos is enjoying her best ever year in singles, currently posting a 19-11 W-L record, which has included seven top 50 wins. The win over Venus matched her previous best win of the year (by ranking) over Karolina Pliskova in Miami. In another all unseeded match-up, Angelique Kerber’s last two conquerors on the tour will go head-to-head. Bouchard had a superb win over Kerber in Rome; while she failed to take advantage of a 6-1 *3-0 lead, she eventually served out the match in the third set, reaping the benefits of being the player more willing to go for their shots. Strycova has continued to save her best tennis for the tournaments that really count. The Czech player won 12 out of the last 14 games to overcome Heather Watson on Wednesday, 6-4 6-2 and reach the last 16 in Rome. Head-to-head record: Bouchard leads Strycova, 3-1 in their head-to-head. Strycova won their last match in Madrid last year, 0-6 6-3 6-3 although this was during Bouchard’s mega slump last year. Interesting stat (s): Heading into Rome, Strycova had exactly the same number of wins on the WTA tour that she had at this stage in 2015… 16. For Bouchard, her victory over Kerber was not only her first top ten win since 2014 but it was actually her best ever career win by ranking! Final thoughts: Of all eight matches, this is the one where I can’t call a winner! Strycova has lots of tricks up on her sleeve but generally, Bouchard has had too much weaponry in their previous matches. The second round match against Kerber was a gruelling one, but Bouchard will have plenty of time to recover as she plays Strycova in the late night match. May 11, 2016 in Babos, Bacsinszky, Begu, Bouchard, Doi, Gavrilova, Kasatkina, Keys, Konta, Kuznetsova, McHale, Muguruza, Ostapenko, Rome, Serena, Strycova, Suarez Navarro, WTA. Ha, there is a witchy Strycova that turns up sometimes to play. That woman would be more than a handful for Genie especially if she is tired. I think Bouchard has got this. Alas, she appeared, completely dismantled Bouchard. Onwards to Madison Keys who is in good form herself. I agree with 6 of these.. i’ve gone for Muguruza and Keys. Yeah I think those could go either way. I think Babos is better on clay than Keys and probably a better player all round really. But of course she just had a tough three setter to recover from. She’ll either see it as an enormous boost or go into the next round a bit flat. Fair points, I agree Babos is a better player on clay. And i’m intrigued to see how Muguruza backs up yesterday’s rout of Makarova. How were Muguruza and Begu? Watching on live scores so can’t tell you how they played, Begu was 6-1 5-0, then sounded like she wobbled before serving it out at 3rd opportunity. Disappointed for Kasatkina, thought she’d keep it closer. Muguruza was 1-4 in the second set and won 5 straight games. It’s go time for Muguruza right now. She has so many points to defend in the next 6 weeks between Roland Garros and Wimbledon. Doi’s got a great game, i’m glad to see her doing well this week. Fun fun match from Gavrilova and Kuznetsova. Svetlana looked a little tired in set 2 and hit some less than sharp volleys, but credit to Dasha for some ballsy play. This is her 19th win of 2016 though, she had 27 last year. And so far she’s 10-2 in 3 setters! I heard it was good, going to try and watch back later tonight. Definitely do. There was a period in the second set where Gavrilova just wasnt missing the lines at all. If Kuznetsova can keep up this more aggressive kind of play then she could actually have some success on grass this year. She’s serving better than she has in half a decade, getting real weight on it again. I really enjoyed the Gavrilova and Kuznetsova match but not the result. Dasha has become a joy to watch in my opinion and I thought that she was going to win this at one stage and she does seem to be gaining confidence. I think that it may not be too long until she wins her maiden WTA title. Needs to get some consistency going – she can sometimes play great tennis but I can’t think of any other player who manages to miss as many easy shots as she presently does. Credit to Kuznetsova for her performance though – still capable of playing well when it matters. I was a bit worried about Dasha after AO but she’s had a decent clay court season. 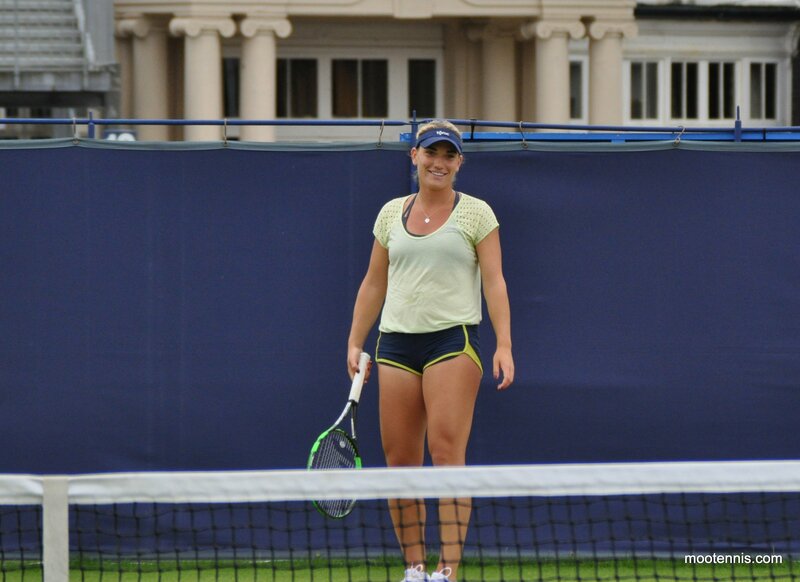 She’s so much fun to watch, I gained a lot of respect for her watching a match she played against Giorgi in Eastbourne last year.